I’ve had a book on my To Be Read list for almost a year now (since last November), when the author came to Durango to speak. Her name is Dee Williams. And she wrote a book called The Big Tiny: A Built-It-Myself Memoir. Ms. Williams is 50 years old this year, and this book was published in 2014, when she was 49. She grew up on a farm in Missouri, and moved west as an adult, so she could climb mountains and kayak and participate in all kinds of fun outdoor sports, which she did, all through her twenties and thirties. She ended up living in Portland, Oregon, where she bought a rundown house for $200,000.00, and in between house projects and building kayaks and having fun with her friends, she had different government jobs (teacher, chemical waste inspector) that paid very little. But, like a lot of fun-loving people who make very little, she pushed herself hard to make it all work. While she was in Portland, at age 40, Ms. Williams collapsed, spent several days in the hospital, and was diagnosed with a heart condition. She had to get equipment installed in her heart muscle to keep her ticker thumping correctly, and she also had to face her mortality in a big way. Like someone diagnosed with cancer, death appeared at the window, and Ms. Williams couldn’t laugh and run away and forget that one day, maybe one day quite soon, she was going to die. Death was in her life now, standing there on the other side of the glass. The heart condition shortened her life expectancy, though she doesn’t name any numbers in the book. It’s just known that heart conditions weaken the heart, and weaker hearts tend to crap out on you faster than healthy ones. Though we all know that is not always the case. Healthy people can drop dead from a heart attack at a very young age, and people with weak hearts can live past one hundred. Life is never predictable. But back to Ms. Williams, who had to face Death with a capital D at age 40. Had to accept that she could die any moment, because her heart has issues, and it could just stop thumping, and then bye-bye, little miss, it was nice knowing you. In the course of dealing with her new heart condition, Ms. Williams couldn’t push herself as hard as she had before. She had to stop her morning runs, slow down, allow herself time to heal from surgeries and other issues that come with her condition. 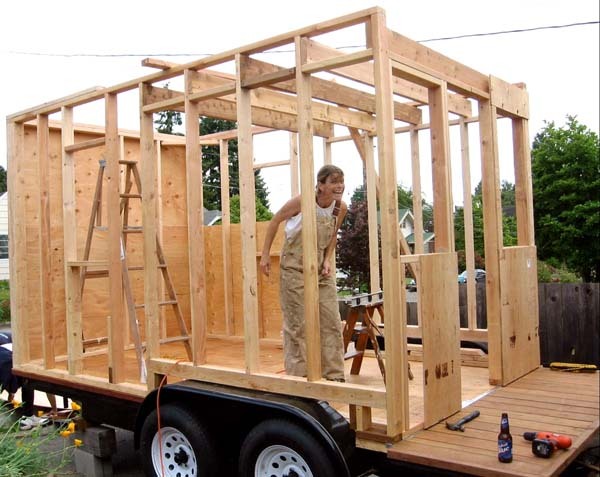 Then one day, in a medical waiting room, she came across an article about a man who built his own tiny house. The article inspired Ms. Williams so much that she ended up building one herself, and that remarkable journey is what her memoir is about. The book is short and very easy to read. Ms. Williams is quirky and zany, and her memoir is full of her quirky zaniness. Her prose is simple and honest, and her honesty on the page gives the book its greatest value. 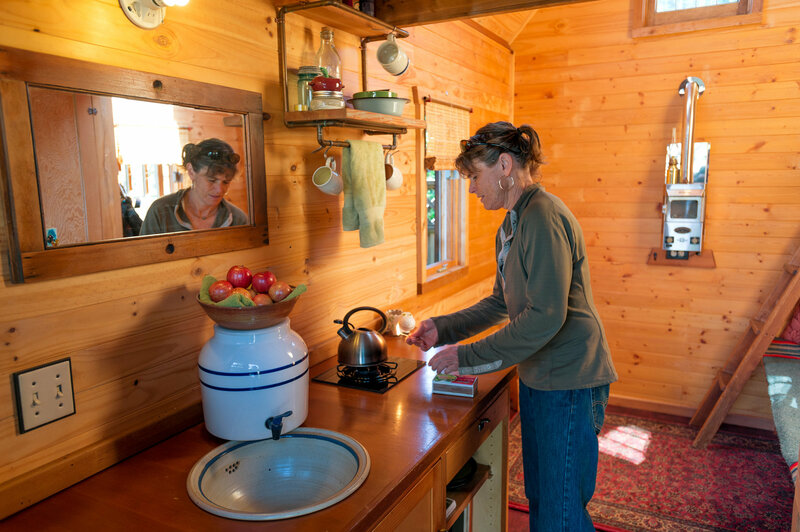 Here is a life and a journey to build a tiny home on a trailer, and there is great joy in the transformation of creating something new, and learning to live small, which is actually an expansion of life, not a contraction. Ms. Williams lets the reader know of various moments in life when she has been afraid, when she’s burst into tears and sobbed, or scream-sobbed in grief or in pain, and she does this without trying to wallow in pity. She just gives a straightforward account of her responses to hardship in life. The book inspired me to do some downsizing of my own. Not because I own tons of stuff, but because even with what little I do own, there are things I don’t use. So I went into my closet and opened a box of jewelry I never wear. Three silver bracelets, I decided to sell to a jeweler in town who buys silver. The rest, I took to the Methodist Thrift Store. The hardest thing about giving away unused belongings is that you have a relationship with every object around you, especially objects you own, and if you have loved something, you want it to have a good home, not end up as trash. When I placed these few items of jewelry on the counter, a woman working there immediately fell in love with a black lace necklace — a necklace I bought 17 years ago, to help my uncle with the Silverton Gunfighters, a nonprofit group that raises money for charity — and I was so glad that, of the handful of items I placed on the counter, this was the necklace the woman picked up with joy. She asked me if I would mind if she “put her name on it” right then, and I said, of course not! And I said to just take it, but there must be a rule in the store about this, because she took a piece of masking tape, wrote down her name, and attached it to the necklace. I asked her if she wore Victorian clothes, and she said yes, absolutely, she loved dressing in Victorian costumes, and this necklace was going to look beautiful with her ensemble. Which gave me some peace. But it’s still hard to recognize that I have objects in my life I don’t use, and then summon the energy required into organizing these items in such a way as to part with them. Like a lot of people, I have strong connections to physical objects, and those connections are the reason why it’s so hard to ever go shopping, for clothes or for anything. Things aren’t just “things” to me. They have totemic worth, an energy value that is hard to sever once a bond is established. My mom is a hoarder, someone who struggles to part with broken items and garbage, as well as the sort of “no longer used” items I struggle to part with, and maybe some of my extra sensitivity with physical objects runs in my genes. When my 16-year-old drip-coffee pot stopped working in December, I paid $30.00 trying to have it repaired, rather than buy a new Mr. Coffee. In the end, the money was wasted, the heating coil wasn’t repairable, and I spent $14.00 on a new Mr. Coffee. I still have the broken one, because I have a friend who lives in Phoenix, and there is a small-appliance recycler in Phoenix. So the next time I go to visit her, I’ll be able to recycle my beloved Mr. Coffee, which went to college with me, and has made my drip coffee through my whole adult life. I tear up just typing this, having to say goodbye to my beloved coffee pot. Which sounds sooooooo incredibly corny, but is 100 percent true. Though it’s certainly not difficult for me to give things away. I’ve given away vehicles, furniture, appliances, movies, toys, clothing, and books. Right after my wedding day (when I lived in Ouray), I had my gown and veil dry-cleaned, and donated them to Heirlooms for Hospice, in Montrose, Colorado. Both items sold within a week (go, hospice!) and someone at the store even sent me a thank-you card for the donation, the only time I’ve ever received a hand-written thank you for a donation. So obviously, there are some items I *know* I’m not going to keep, and these items don’t enter into my life with any emotional attachments. I know their purpose is limited, and I pay to have them cleaned and/or repaired (if that’s necessary) before I send them on their way. I’ve done this with all kinds of belongings, and it makes me feel good. The hard thing about life is that we often buy things we never use, not even once, and these are the things that are sometimes the hardest to part with. You look at a jacket you’ve spent good money on, telling yourself you’ll use it one day. Or a dress or a tie that’s never left your closet, or a million other small things that add up very quickly. The single biggest source of unused items in my life is my mom. Over the years, she’s brought me dozens and dozens of items I’ve never used. “They’re cheap,” she says of these things, which is her justification for spending money on them, and then presenting them as Christmas gifts. These are all kinds of clearance bin items, like an exercise DVD of hula-dancing, or plastic baby toys made in China, or a pair of hot pink scratchy socks, or a see-through shirt with huge stretchy pockets, or a bag of two hundred miniature plastic film reels thin as paper, or see-through underwear made from fishing line, or stuffed bears with google eyes meant to hang from a rearview mirror. These are not things I would use, but since they are gifts, they “stick” harder in my life. Gift items always come with emotion, really strong emotion. So I end up struggling with these items from my mom, and keeping them for decades, even though I’m not about to start hula-dancing, or play with weird baby toys that would choke a real baby, or wear underwear made from fishing line. I suspect we all receive generous doses of presents like these in our lives. The kind of stuff that makes white elephant parties at work really funny. Considering easier items to part with, ones I’ve bought for myself, I found two jackets, three skirts, and four lacy blouses I haven’t worn in a decade, and will probably never wear again (because I’m so lame with fashion), so I called Reruns to have them looked over. I think Ms. Williams would be proud of my efforts, especially knowing they were inspired by reading her book. I’m nowhere close to being a true minimalist. I can’t take out a single sheet of paper, and write down every single object I own, straight from memory. But I greatly admire that Ms. Williams can do this. In a world greased by the wheels of consumerism, this kind of mindfulness about our belongings is beautiful, and her memoir is a lovely reminder that less is more, in more ways than one. So if you need some inspiration, The Big Tiny is waiting. I just finished Williams memoir as well. I enjoyed it but I didn’t love it as much as you did. 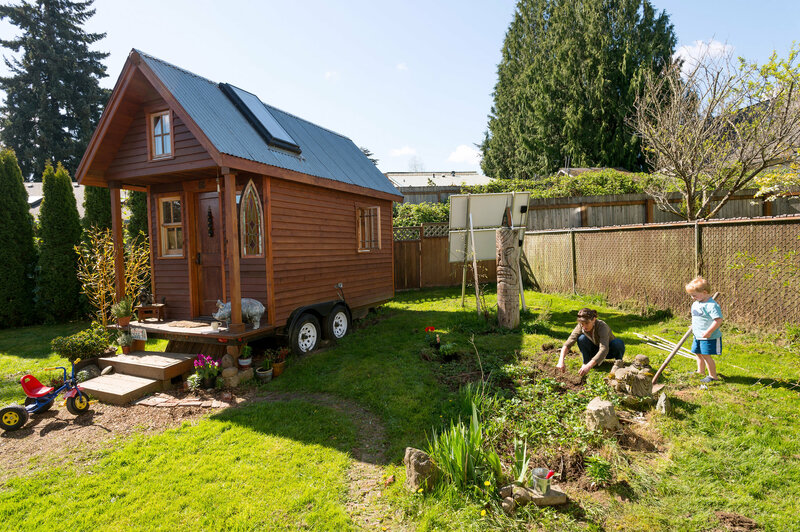 I know and love the idea of tiny homes and minimizing things. It’s a process and struggle sometimes but I keep trying to part with things. If you’re interested in my review, it’s going up tomorrow on my blog.